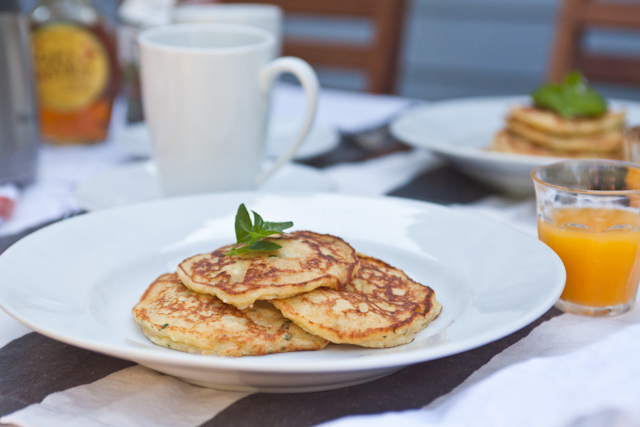 Mint in your pancakes? YES! 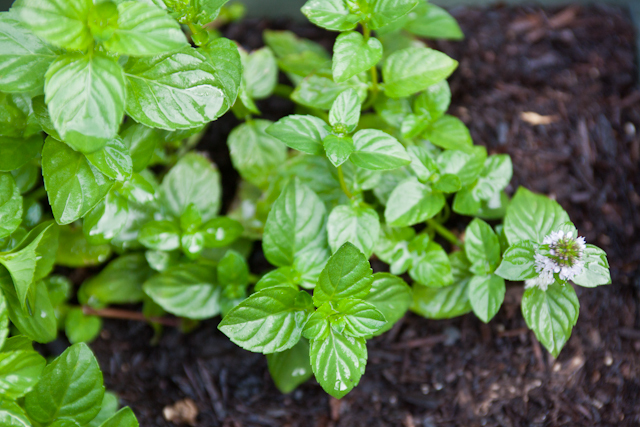 I have never tried anything even close to this before but for some reason I was inspired to try it… perhaps its because ‘orange mint’* is the only thing I can seem to grow. It grows like a weed which I love because I use it in many recipes and now pancakes are no exception! Our neighbor has an orange tree and allows us to pick from it daily, which we do. 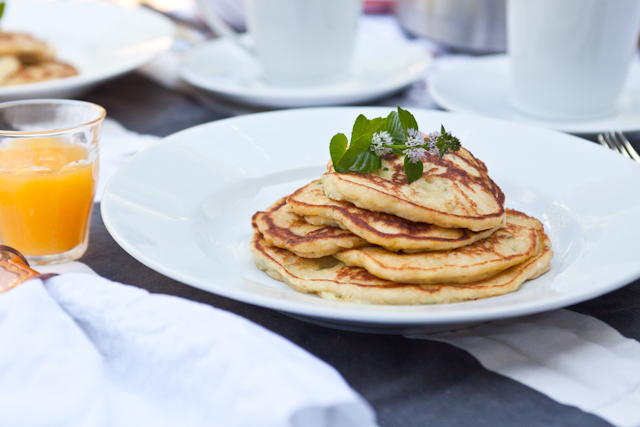 This recipe creates exceptionally fresh, tasty and surprisingly delicious pancakes! 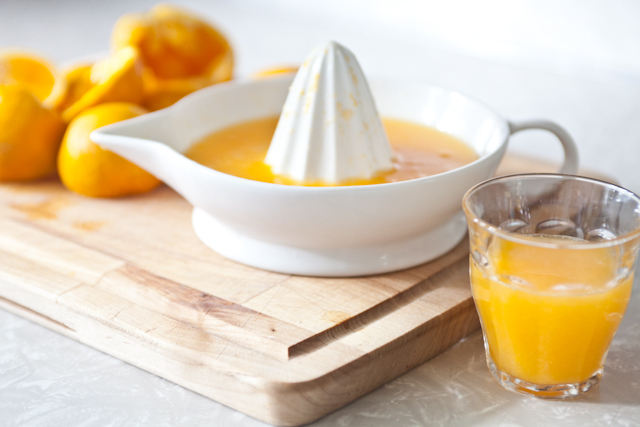 If you do not have fresh squeezed orange juice, no problem! Store bought with pulp will deliver great results as well! 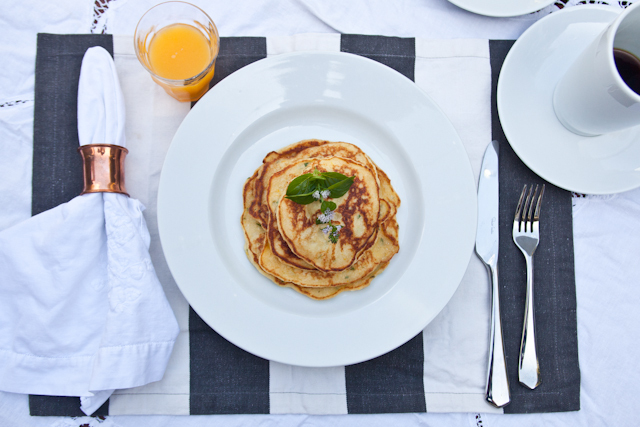 We hope you enjoy these hot cakes as much as we did. It felt as though we were somehow combining summer and fall in this meal, which to me is quintessential “September” the perfect combination of summer and fall. Enjoy! In a large bowl combine all dry ingredients, stir. In a small bowl combine all wet ingredients (including chopped mint and orange zest). Add wet ingredients into dry ingredients and stir until just combined. On a medium high, cook pancakes. Top with maple syrup and enjoy! *** ‘Orange Mint’ – its a real thing – it is much more mild in taste then traditional mint and even a hint sweeter. It is fantastic and works beautifully in this recipe. If you only have traditional mint, no problem, perhaps use 2 teaspoons instead of a tablespoon so as not to overpower the hot cakes. 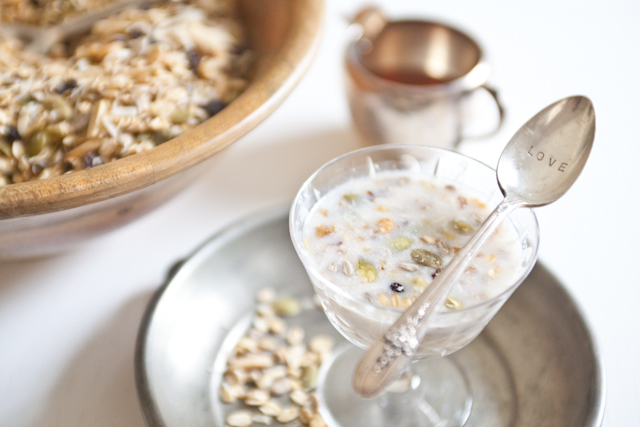 The difference between Muesli and Granola is simple. Granola is baked. Muesli is not. 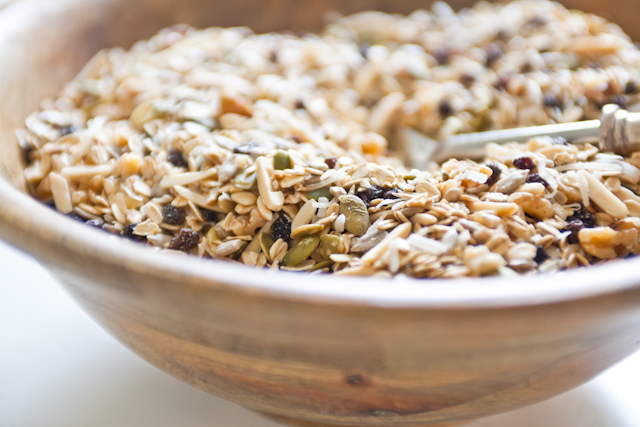 Granola typically has added sugar for sweetness and oil for crunch. 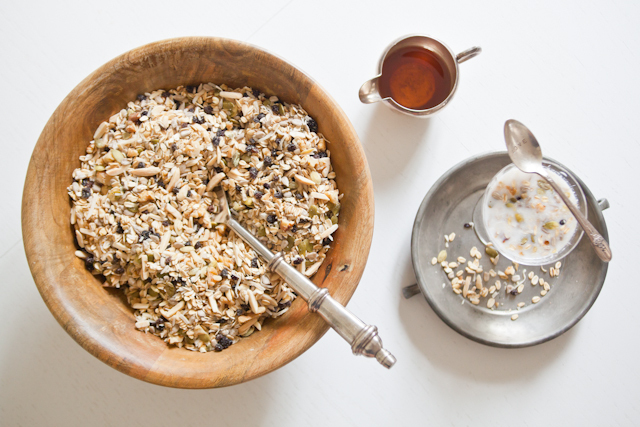 Muesli is the raw version if you will. This nutrient dense breakfast item is wonderful atop the tropical storm smoothie or a bed of yogurt with a little honey drizzled across the top. Eat it with fresh banana milk (1 frozen banana blended with 1 cup water and a dash of honey) or coconut milk for a quick breakfast on the go or even soak it the night before in milk and have a breakfast porridge waiting for you when you wake up. Really there are so many options. You can not mess this up so take liberty when making your perfect blend. We make ours as follows. Mix all the ingredients in a bowl and store in an air tight container. We like our Muesli pretty ‘nutty’ so we do a 2:1 ratio. We have double the nuts/seeds/fruit to oatmeal ratio but that is personal preference. We also choose sprouted nuts/seeds when we can because it is easier on your digestive system but raw or even toasted nuts and seeds will be just fine! You can not mess this up so take a look in your pantry and create your own! 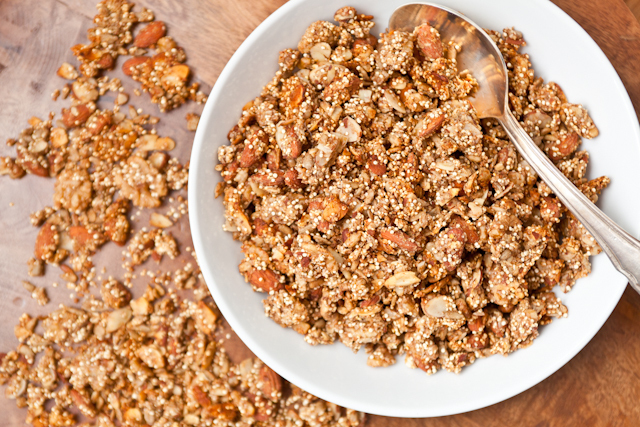 Introducing a delicious granola that is packed with nutrients (thank you Mckel!). Contrary to store bought granola, this is made without any refined sugars or oil. Rob and I enjoyed this with banana milk (1 frozen banana + 1 cup cold water + 1 teaspoon agave = banana milk). It is great for a post workout meal or really anytime. I was inspired by Mckel at Nutrition Stripped. She is a creative genius in the kitchen when it comes to plant based, nutrient dense dishes. You can check out her website for the recipe. I have changed a few things but I stayed pretty true to her original. This is very fast and easy to make! Great to have on hand for a quick snack. You can add any combination of dried fruits or dark chocolate for an extra treat! Or top a green smoothie bowl (as we did this morning) and enjoy! 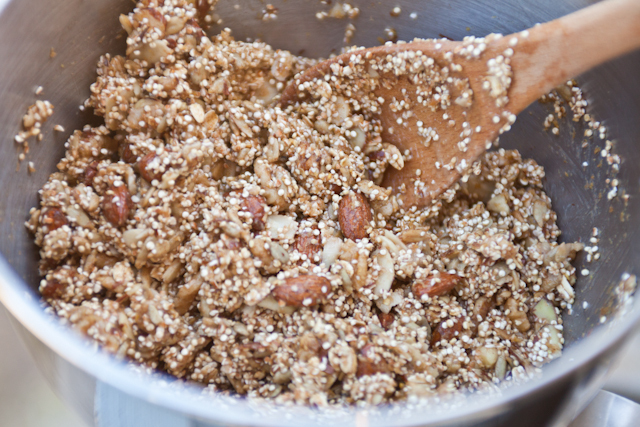 Toss all the nuts, grains and seeds together in a large bowl. 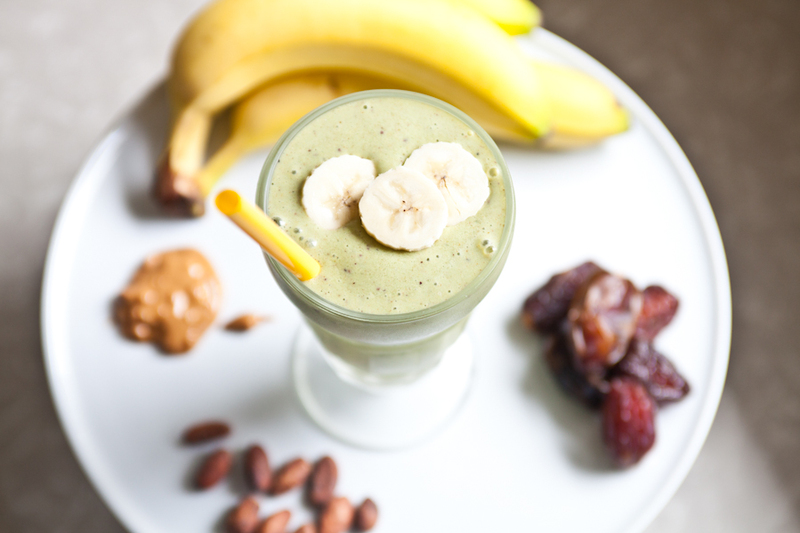 Using your blender or a food processor, puree together the bananas, honey and nut butter. Then pour over dry ingredients. Mix thoroughly. Pour onto a parchment lined baking sheet, creating a thin even layer. Place in the over at 350 degrees for 15 minutes. Stir well, then bake 15 minutes longer. Let cool and store in an airtight container. 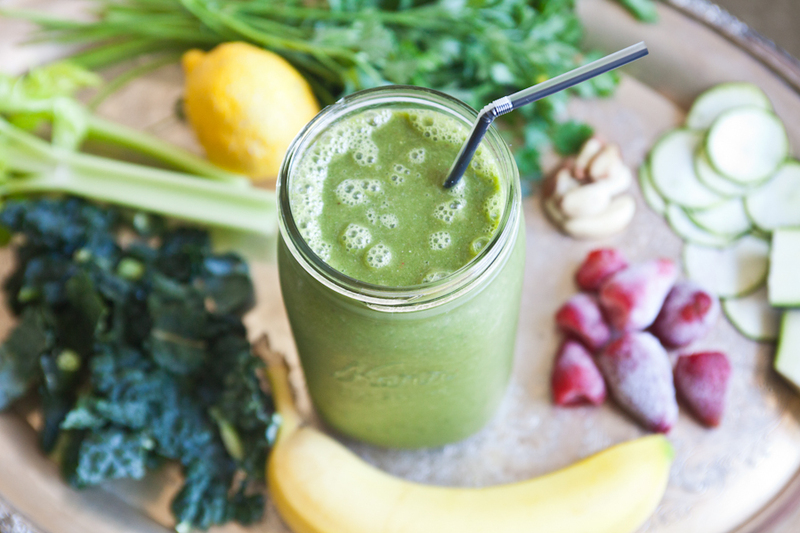 Just as her name describes… she is full of greens and you feel almost superhuman for drinking this “smoothie”… I’m not going to lie…its not as smooth going down as say the “banana nut” smoothie BUT it packs a punch in the nutritional category! 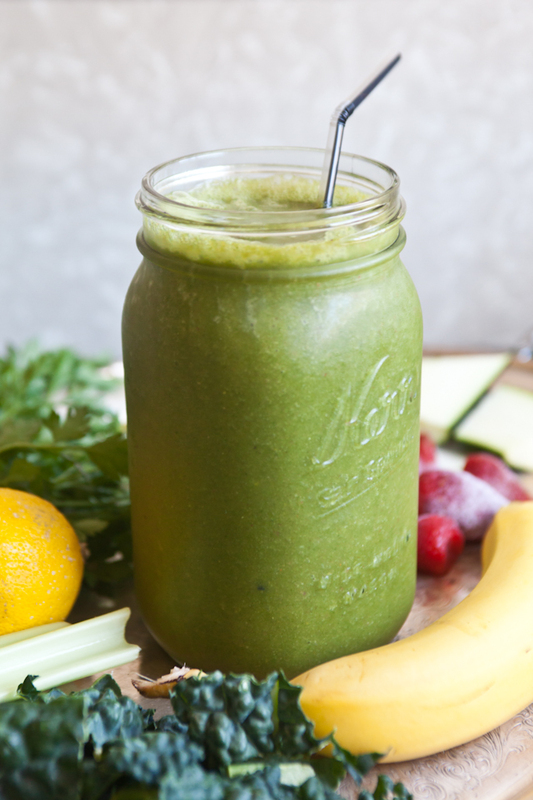 Confession: I can’t stop drinking this smoothie… not for the taste, that would be a lie, but because it really does provide so much nutrients, you feel like a million bucks for drinking it and it keeps me satisfied for a few hours! You may need to play around with the ingredients to find what is most palatable for you… if you come up with something great – share with the rest of us and leave a comment! I should note, Rob made a great point as he was sucking his portion down with an almost a child like “if I have to” face… the cayenne is a bit spicy… he was more worried about how this smoothie exits the body if you know what I mean… but we can verify from experience that this is not something to be worried about. Although, your throat may tingle after ingesting. Go big and give the green goddess a chance! Spinach – as noted in the banana nut smoothie, spinach packs a punch in the potassium and magnesium category, high in fiber and great source of iron. Kale – a super food! Kale’s risk-lowering benefits for cancer have recently been extended to at least five different types of cancer. These types include cancer of the bladder, breast, colon, ovary and prostate. Kale is recognized as providing support for the body’s detoxification system and is packed with 45 different flavonoids! Lastly, it is high in vitamins K, A and C! Celery – well I need to apologize to the reference I made to this “calorie-less cracker”! Celery is actually an important food source of conventional antioxidant nutrients such as, vitamin C, beta-carotene and manganese. Further, it is packed with phytonutrients which help with anti-inflammatory benefits! Zucchini – great source of manganese and vitamin C but it also contains antioxidant nutrients that are especially helpful in protection of the eyes, including protection against age-related macular degeneration and cataracts! Banana – a natural antidepressant… thank you tryptophan! Also, high in potassium and contains 3 grams of fiber. Strawberries – antioxidant and anti-inflammatory nutrients cause this little berry to have three major benefits… cardiovascular support, improved regulation of blood sugar and prevention of certain cancer types. Parsley – high in chemoprotective compounds (anti-cancer)! Lemons & Limes – both contain unique flavonoid compounds that have antioxidant and anti-cancer properties! 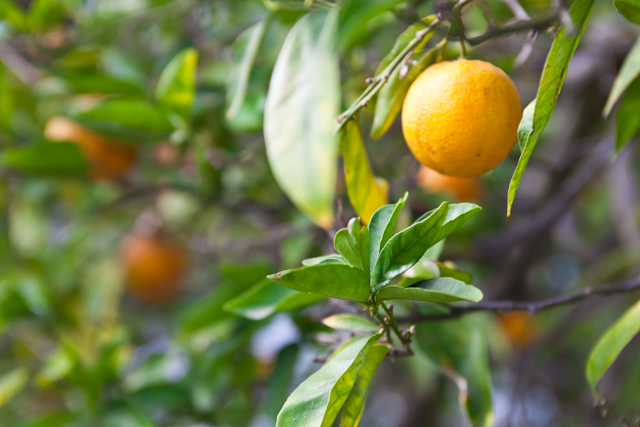 They are a great source of vitamin C which helps the body neutralize free radicals! Brazil nuts – high in selenium (supports a healthy thyroid). One nut goes a long way! Cayenne- stimulates digestion and helps boost immune system also fights inflammation! Remember… just a dash! Put all the ingredients in a vita mix and blend away. You can of course substitute a fruit or veggie to suit your taste or to use any left over veggies you may have on hand. But remember, this is for health over deliciousness so try it and see how it goes… Your body will thank you! I should note that the health benefits for each fruit and vegetable are from internet sources. If you have questions or concerns you should ask a health care professional. 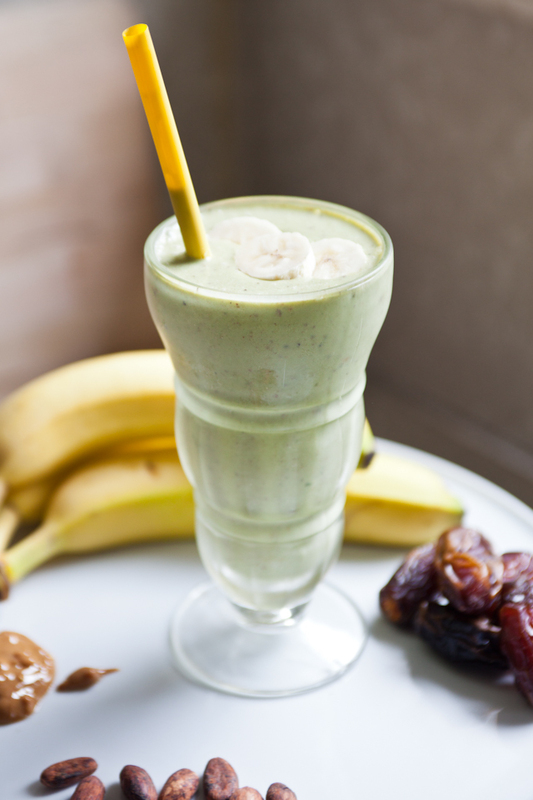 This delicious smoothie or dare I even say it… dessert… is a must try! Perfect for post workout nourishment or maybe its your after dinner delight (good-bye breyers) or maybe its the kiddos choice… either way this is fantastic and while it taste too good to be true… it actually packs a punch in the nutrition category. Spinach… nut just for Popeye… do I really need to convince you of this healthy leaf? Spinach is a great non-heme source of iron giving your body the energy it needs! Further, it is possibly one of the best sources of dietary potassium and full of magnesium (great for energy metabolism and muscle and nerve function! The list goes on… needless to say, its worth adding a cup to the smoothie! Peanut butter… not just for kids! 7.7 grams of protein, which helps keep your tissues strong and promotes immune function! Banana…not just for monkeys! High in tryptophan (great for fighting the blues)… high in potassium and 3 grams of fiber! Ground flax seed… Full of omega-3 essential fatty acids… great heart-healthy effects! Fiber, both soluble and insoluble… power seed! Cacoa beans are a great source of antioxidants and natural energy! Dates… not just for sweetness! Really! Dates are full of tannins… they are know to have an anti-infective, anti-inflammatory and anti-hemorrhagic properties! Also they have a moderate amount of vitamin-A and rich in fiber, which prevents LDL cholesterol absorption in the gut! Enjoy and feel good about it! © Copyright Chopped and Tossed 2019.